Sometimes a story comes along that’s so beautiful and so special that you have to fight past the tightness in your chest and remind yourself to breathe. That’s what happened when I encountered three nuns who went out of their way to adopt Remy, a 9-year-old pit bull who had been languishing at a shelter for months. It’s not every day that three women in their 70s and 80s walk into an animal shelter and tell the executive director they’d like to see a dog nobody wants. That mind-set led them to Remy, a 9-year-old pit bull that had been overlooked by shelter visitors for more than three months. “As soon as I saw the sign that said ‘9 years,’ I said, ‘This is the one. No one is going to want this one,’” recalled Sister Veronica, a vivacious 71-year-old with iron-colored hair and a no-nonsense demeanor. Sister Virginia Johnson gives Remy a hug at their home in Nyack, New York.Copyright Lori Fusaro / "My Old Dog"
For the nuns, a four-legged addition to their small, no-frills convent could not come fast enough. They were grieving the loss of their dog Kate, a gregarious 7-year-old mutt who had been a boundless source of energy and comedy in their lives. In shelters across the United States, it’s common for senior dogs and pit bulls to languish, unwanted, before being euthanized. Like Remy, many of those dogs could have years of adventure and affection ahead of them.Copyright Lori Fusaro / "My Old Dog"
The sisters rattled around their house crying for one week before they decisively hopped into their car. Their mission: rescue a shelter animal on death row. Minutes later, they explained their goal to West Artope, executive director of the Hi Tor Animal Care Center in Pomona, New York. West liked these women. He learned that Sister Alice was 87 and that Sister Virginia, while statuesque and spunky, often needed a walker to get around. His mind raced and made a hopeful connection: Remy. Calm, gentle, unadoptable Remy. The nuns said they weren’t concerned that Remy was a pit bull — they could tell how good-natured she was. And even though they were reeling from Kate’s death, they decided not to dwell on Remy’s age, either. They love living in Nyack because of Hook Mountain, the Hudson River, and other natural wonders that surround them. Many people think it will be too sad to open their homes to dogs over the age of 6 or 7, even though they tend to make the calmest, easiest pets and they’re often already house-trained. The nuns said Remy fit right into their lives.Copyright Lori Fusaro / "My Old Dog"
Veronica loves having a dog to take along on contemplative walks and hikes. Remy also gets to romp in the tree-filled backyard, play with scads of toys, and luxuriate on soft dog beds in multiple rooms of her new, comfortable home. Remy quickly earned a nickname — Thumper — because of the happy way her heavy tail goes thump, thump, thump whenever one of the nuns approaches her or rubs her stiff left hip. Excerpted from the book "My Old Dog: Rescued Pets with Remarkable Second Acts." Text copyright 2015 by Laura T. Coffey. Photograph copyright 2015 by Lori Fusaro. Reprinted with permission from New World Library. Laura T. Coffey is a longtime writer, editor and producer for TODAY.com. An award-winning journalist with more than two decades of experience, Laura has written and edited hundreds of high-profile human-interest stories. 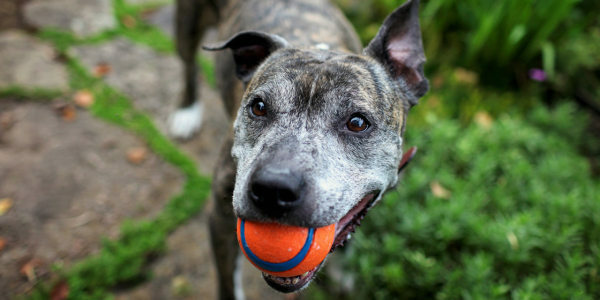 Lori Fusaro is staff photographer at Best Friends Animal Society in Los Angeles and owner of Fusaro Photography, whose clients include BAD RAP, Guide Dogs for the Blind, k9 connection, Angel City Pit Bulls, and other animal rescue organizations. Their website is www.MyOldDogBook.com. A Los Angeles animal photographer is on a mission: To change people's perceptions of older dogs and help more gray-muzzled pooches find loving homes. See images from her "My Old Dog" project here.